SYNOPSIS: Clark Hayden is a graduate student trying to help his mother navigate through the loss of his father while she continues to live in their house near Washington DC. With his mother’s diminishing mental capacity becoming the norm, Clark expects a certain amount of craziness as he heads home for the holidays. What he couldn’t possibly anticipate, though, is that he would find himself catapulted into the middle of a terrorist operation. As the holiday festivities reach a crescendo, a terrorist cell – which happens to be across the street – is activated. Suddenly Clark is discovering things he never knew about deadly chemicals, secret government operations, suspiciously missing neighbors, and the intentions of a gorgeous IRS auditor. Clark’s quiet suburban neighborhood is about to become one of the most deadly places on the planet, and it’s up to Clark to prevent the loss of hundreds of thousands of innocent lives in the nation’s capital. Review: This book took me almost two full months to read. The story/action were great, but I was not a fan of the writing and some of the cruder language used and I am a crude language user! It just seemed unnecessary and distracting from the very exciting story that was playing out. As in, did the writer NEED to say, "he shook his friend when he was done????" The answer is no, he did not. Maybe I went into this with more expectations, but the writing style just wasn't my thing. The story? intriguing and I loved the terrorist on U.S. soil aspect. It was a good story. I was fascinated by how Ariana (terrorist) was able to stay 'underground' for so many years and quietly and smartly plan out an impressive task. Also, scary and interesting how they were planning on carrying out the attack. And for a first book? Impressive. But overall? It was just a little on the meh side for me. If you are looking for a fast-paced suspense novel this is for you. Don't listen to me ramble about me taking forever to read this, I got aggravated with the writing and made it take longer than necessary, but this is a quick read. Giveaway - Now for those of you intrigued by this book or who have already read and enjoyed this book, I've got a surprise for you! I have one copy of Mark Gilleo's new book, Sweat, to give to one lucky person! If you are interested in the book, just leave a comment on this post before 11:59 pm on May 31st. I will be announcing the winner on June 1st. If you would like increase your chance of winning a copy of Sweat by Mark Gilleo, tweet / link whatever and just post a link in the comments! Only one tweet/link/whatever per day. Thank you! From Mark's website - Sweat is what happens when a US senator, a third world seamstress, a hit man, an arms dealer and a spy collide with a young man who is trying to do the right thing. I received this book from Partners In Crime Tours. All thoughts and opinions are my own. This book was so heavy. Definitely not a light read for the beach, which is where I read it. Kristin Hannah has such a way with words and I feel like I am repeating myself from the last time, but it's truth. I felt so much during this book. Heartache, anger, frustration... Real feelings for real characters. I cannot fathom how people survived the Nazis. I suppose you just did it. But how broken they must have been. So strong, tough and silent. As a mother, I would have wanted death, much like Anya tried to accomplish. What pure torture to go on and have more children. 1. Anya Whitson is color blind and cannot see the colors in her winter garden. Why do you think the author gave the character this particular trait? In what ways is it a metaphor for what Anya has gone through in her life? Do you believe it is a physiological blindness or a psychological one? 2. Memory is an important theme in Winter Garden. Meredith often regrets--when looking at old family photos taken without her--that she was often off organizing or obsessing over details, while everyone else was living in the moment, creating memories. How common is this for women and mothers? What memories keep your family together? 3. Jeff tells Meredith that “words matter.” What are some examples of this throughout the story? How have words saved and harmed each of these characters’ lives? How has silence saved and harmed each of these characters’ lives? How do words—the telling of the fairy tale—change their individual and collective perceptions of who they are? 4. Anya is an unsympathetic character throughout much of the book. How did your perception of her change as the fairy tale unfolded? Did you end up sympathizing with her, or even liking her? Or do you feel that her treatment of her daughters was inexcusable, regardless of the hardships she had faced in her life? How do you think you would have fared in Leningrad under the siege? Was Anya heroic in Leningrad, or a failure? 5. How did you feel about the ending? Why do you think the author chose the surprising meeting in Sitka? May's selection will be The Year of Fog by Michelle Richmond. I sady have gotten rid of my copy so I will hopefully be able to pick it up at the library. I think I read it back in 2008 on our honeymoon (JAMAICA!) and I flew through it. Today we have my friend Daysie. I met Daysie twoish years ago on a website when we were both trying to get pregnant. She is a sweetheart, kind, caring and still fighting for her chance to be a mother. I find it fitting for Daysie to be sharing her day in the life with you today, during National Infertility Awareness Week. Infertility affects around 73 million people or about 1 in 8 couples please check out Resolve.org for more information. Thanks for sharing Days! You can learn more about her journey on her blog, My Story. My Family. My Life. 2:13 am – I wake up because I cannot sleep. I have a fever of 100.7, again. I play on my phone for a little bit. 2:45 am – I try to fall back asleep. 7:13am – I wake up again, this time for the day. I lay in bed for a few extra minutes. 7:50am - I get out of bed, go to the bathroom. 7:51am – I start the shower, find my sudea care shower soother in hopes it will help me feel better. 7:55am – Toss shower soother in the shower and get in. 8:12am – I got to get out the shower. Spending too much time in here and I'm getting dizzy. 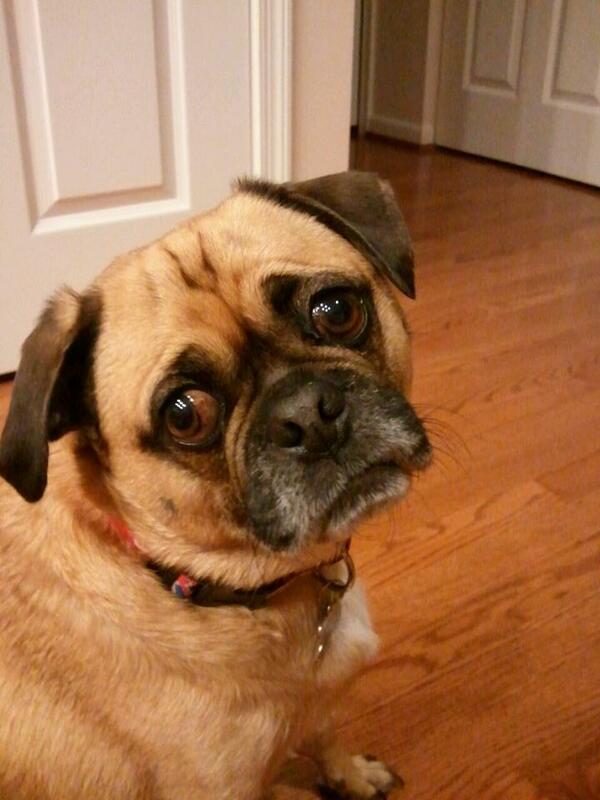 8:17am – with the towel on my head, I brush my teeth while I go downstairs to let our dog Winston out. 8:19am – get back up stairs to finish brushing my teeth. 8:20am – Run back downstairs to let our dog back inside. 8:24am – Back upstairs to dry my hair, flipping my head upside down makes me dizzy again. 8:31am – I'm going to wear my glasses today, I don't feel well. Time to put make-up on. 8:40am – Go downstairs pack up my medications to bring into the doctors office, make sure I have everything together. I take some Motrin. 8:50am – I put Winston in his crate, get DH to get the Meds in the car and we leave to go to the doctors together. 9:23am – I check in and get sent back to the lab. 9:25am – My blood is drawn. 9:30 am – I get sent into the exam room for my baseline ultrasound and we find out everything is quiet, just as it should be. 9:45am – Both DH and I head into an office with the Pato go over how to administer my medications. 10:21am – Appointment is over and we check out. 10:25 – In the car to head back home. 11am- I gather everything I need for my phone interview I have at 1pm. 11:15am – I finally eat breakfast, a plain bagel with plain cream cheese. 12pm – DH makes me some hot tea with lemon and honey. 12:05pm – DH gathers up some extra pens and paper and sets up the computer for the interview for me. 1:03pm – Phone rings.... "Hello"... Phone interviews begins and DH goes upstairs. 1:22pm – Phone interview Ends. I call for DH to come downstairs. I'm not sure how it went. 1:30pm – DH gets ready for work while I change back into normal clothes. 1:40pm – We both head out the door. DH goes to work, I head out to the pharmacy to drop off one last prescription that needs to be filled before tomorrow. 2pm – I arrive back home and take the dog for a walk and get the mail. 2:10pm- I call my grandmother. 2:20pm – I finish up the phone call. 3:14pm - I'm still enjoying my downtime now. Checking my message boards on my phone and finishing up some DVR'ed show. 3:22pm – Show is over time to turn off the TV and get ready to run back to the pharmacy to pick up the script. 3:46pm – in the car on my way to the pharmacy. 4pm – I finally get the prescriptions. 4:03pm – Back in the car, I take a look at the prescriptions and notice it said, "No Insurance" Ugg... Now I have to walk back inside to find out why they didn't use my insurance. 4:05pm – I have to give my insurance info to the pharmacist assistant again. Only one of the prescriptions is covered. The other isn't, at least it's only $13.00. I walk back to the car. 4:07 – I drive home. 4:15pm- I'm home, I let the dog out of his crate. 4:25pm- I get up and clean off the table from the phone interview earlier today. Gather all my meds and needles and syringes. I'll need to start my IVF meds tomorrow. Wow this is really happening. I put everything else I don't need yet aside. 4:41pm – Turn the TV back on and do the dishes, and turn some ta water on. 5:45pm – DH comes home from work. 5:49 pm – Go outside and the dog runs over to the neighbor, I walk over to get him, I begin to talk to him. He wanted to know the latest on the other neighbors, and what's going on with our neighborhood. 6:35 pm – Start dinner, DH goes downstairs and grabs the last beer, He's kind enough to share it with me. 6:48pm – Let dinner finish up while I sit on the couch with DH. 6:55pm – Still waiting for the rice to finish cooking. 7:30pm – dishes and clean up the stove and counter. While I do this, DH puts up the new cork board I bought the other day. 8:30pm – Sit down and watch 30 Rock. 9pm – I find out instagram is now available on android. I download it while we watch a repeat episode of The Office. 9:09pm – I run upstairs for some lotion, my hands are so dry. 9:30pm – Head upstairs after turning the TV off and get a glass of water. 9:32 pm – hiccups starts.. great... I close the blinds and curtains in the bedroom. 9:33 – Time to brush my teeth and go to the bathroom and take my vitamins. 9:38 pm – DH comes upstairs with the dog. I take my temperature one last time. Fever is definitely gone. My temp is back to my normal 97.5. 9:40pm – I get into my PJ's. 9:43pm – Get into bed, lights off, hope for a better nights sleep tonight and start a new day tomorrow. Thank you so much Days! Do you know what your normal body temp is? Mine is usually around 96.7, though I haven't routinely taken my temp since I was trying to get pregnant! If you would like to participate in the day in the life series send me an email at pinkflipflops44 at gmail dot com or comment here with your email and I will get back to you! - Finally started my book for our FIRST in PERSON BOOK CLUB meeting!!!!! It's been a crazy week and I am so ready to go back to working my part-time hours. And ready to plan my fun time with my girl this summer. I've tried vailantly to catch up over the weekend on blogs, but I've fallen asleep twice doing so. I apologize. Sum up your week in 3 bullets, please and thank you! Happy Tuesday! Today, we have Jamie, a super sweet new mom. 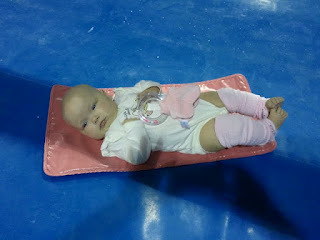 A day in the life of a new mom and competitive gymnastics coach. 5:30 am- Check phone to see how long until nick’s (husband) alarm will go off. Don’t want it to wake up our 4 1/2 month old co-sleeping baby, Ava. 7:30 am - Nick wakes me up to say good bye. Kiss and tell him to be careful. 9:15ish am- Wake up. Sneak out of bedroom. Let out the dogs. Fill up dogs water bowl. Peek in on Ava, Shower and put on makeup. Brush teeth. Grab breast pump parts from kitchen. Check email and face book. 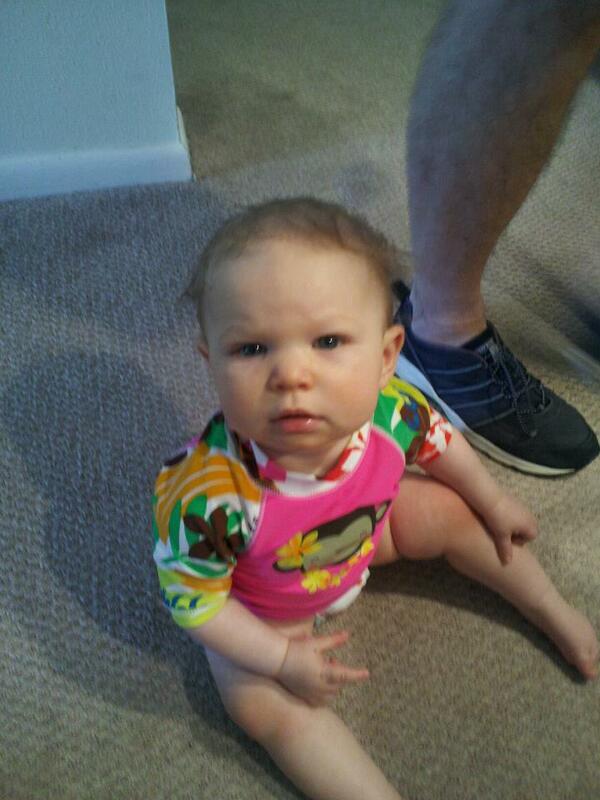 9:50 am - Ava is up. 9:50 - 10:00 am - Listen to Ava coo and “talk” . I love that she wakes up happy and I encourage her to self soothe at both going to sleep and waking up. 10:45 - 11:30 am - Play time in the living room. Usually on her piano play mat. I make the bed and let the dogs out again while she plays, then join her. 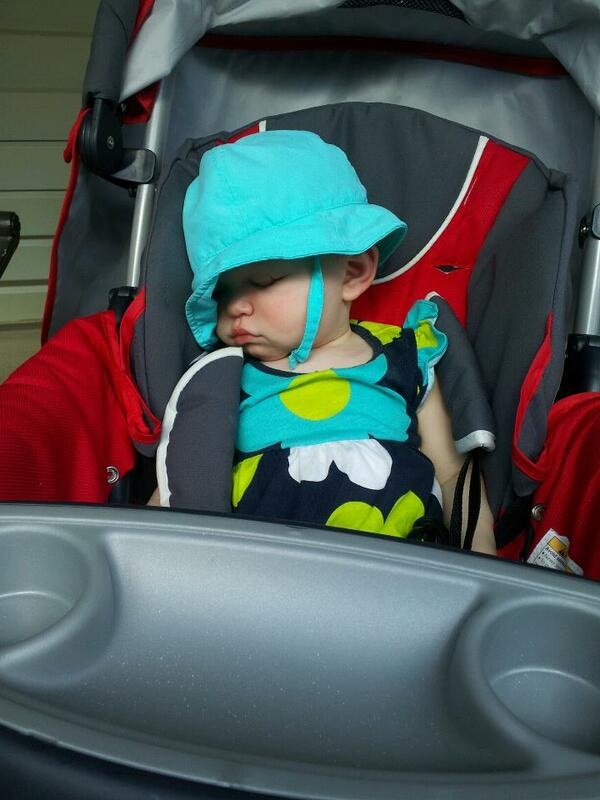 12:00 - 2:45 pm - Ava went down for her nap without any fussing at all. And I am off. Laundry, dishes, trash, pay bills, check email, prepare crockpot for dinner, talk to my mom. 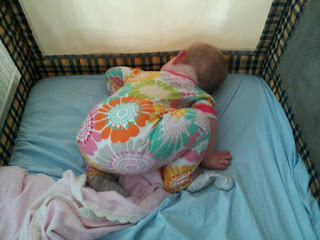 Several peeks in on Ava because she has never slept this long in her crib! 2:45 - 3:30 pm - Ava wakes up. Change her, and put her cool vibrating chair. She is pissed. Nurse her. Back on her playmat while I gather up everything for us to go to the gym. Realize I haven’t eaten. Grab 2 granola bars. 3:45 pm - Head out the door. Off to work. 4:00 - 4:30 pm - Get to the gym. Walk all the way back to my beam area and drop off all our stuff. Head back up to the front. Go to my boss’s office and nurse Ava. 4:30 - 5:00 pm - Practice starts. Ava and I watch the team girls stretch and do basics (simple moves meant for working technique and form) Ava has a blow out and I change her diaper. 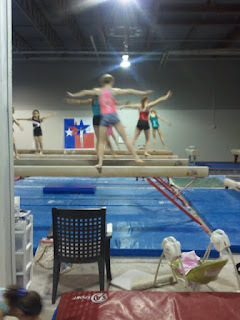 5 - 5:40 pm - First group of girls come to beam. I swaddle Ava and hold her and she is out. Put her in her swing. 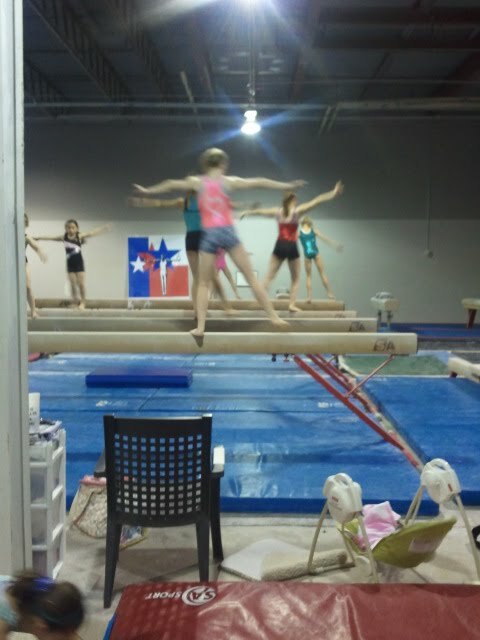 Girls have a good beam day. Yay! 7 - 7:30 - pm - Girls condition and stretch and then we are done! 8 - 8:30 pm - Nurse Ava and eat dinner. Usually at the same time. She is currently on a month long bottle strike or else Nick would have fed her before I got home. 10 - 10:45 Start bedtime routine. Nurse, (shower on a shower day), change diaper, lotion, sleep sack, night night song, swaddle, one of us rocks her. Kisses, turn on humidifier, put her in her rock n play in our room and leave her be. How many alarms do you have to set in the morning? Check out the sidebar later this afternoon for the May Group Read Poll! What I Love On A Monday..
- Eating a lunch my husband packed me..
What shall we read in May? A poll will go up on the side bar on April 17th! So many times while reading this book, I felt raw. So many emotions and so many that were held back and need to be pushed through. Kristin Hannah definitely has a way with words. The heartbreak seeps through the pages. I do not know how Meredith and Nina survived their childhood with a parent so emotionally off. Like, why did the woman reproduce? Why aren't Mere and Nina in constant therapy??? I feel for Mere but she does need to break. You can only take on so much and keep trucking and doing it everything for so long until you reach the point of enough. Everyone needs a break. Even if you won't be able stop crying, the release does a body good. 1. How do you think the peasant and prince fairy tale ends? If you finished, what were your guesses? 2. Will Nina stay or go? 3.What do you think Mere and Jeff need to do to save their relationship? Is it worth saving? 4. Meredith and Nina are both reluctant to let the men in their lives help them through a difficult time, yet both are suffering from the grief caused by the death of their father. Do you think this is something they’ve inherited from their mother? In what other ways are they similar to their mother? Do you think it’s impossible to avoid becoming like the people who raised you? 5. 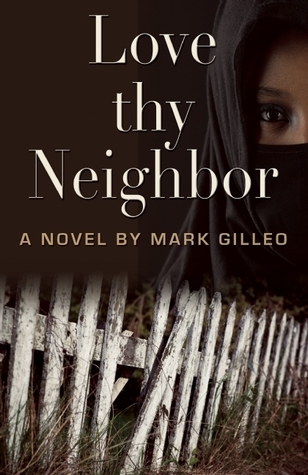 This novel explores a complicated and strained relationship between two sisters. Do you think Meredith is justified in being so angry with Nina? In what ways are the sisters different and in what ways are they alike? Thanks for participating! Next/final discussion will be on April 27th! I have to get up around 6 am for awhile because I'm working full-time for a bit, and mannnnnnn. I do not like moving in the morning. I mean after I pull myself out of bed, I'm good, until the car ride. Then I get sleeeeeepy. Then I stop and get my morning coffee and I'm better again. My daycare arrangement means I actually have to get up and leave way earlier than I would really have to be up and out the door. So I am getting to work a half hour earlier and while it would be nice if that meant I could leave earlier, it does not, since I can't make children leave school earlier. I should totally be using this time to do some projects / or something. Instead? I'll sip my coffee while it is still hot and catch up on the Internet. Did I mention I am not a morning person? And that Isla and I are used to waking up around 8:30? Yeah, shoot me. Today, we have a Stephanie to share a glimpse into her busy life. She works from home while caring for her adorable daughter, Emma. Here is a peek into her life..
Hi, I'm Stephanie - http://ourchangingfocus.blogspot.com the mom of a six month old named Emma. I work from home full time - with lots of help. You're seeing a day in my life when I'm trying to work and wear my mom hat for most of the day, too. Normally, I have someone watching her while I work. 7:20 AM - Miss Emma woke up for the day. Time for a diaper change and nursing session. She's easily distracted and just wants to cuddle. I enjoy our morning cuddles too much to argue. 8:00 AM - Around 8, we move from her room into our room and cuddle, do a little tummy time, practice sitting (and have a little Disney Junior time). She loves to reach for the remote. It is her favorite thing that motivates her to move, so I take advantage! Still no rolling, but she is going from sitting to leaning on her hands. She has no idea what to do once she's in that position. 9:25 AM - We go back to her room. I lay her in the crib and she talks to her mobile, while I take a quick shower. 9:30 AM - Just as I'm stepping in the shower, I hear Molly (our black lab) go crazy. Emma's grandma (her Nanny, my MIL) must be here! 9:45 AM - I hurry and when I get to the bottom of the stairs, I hear my MIL using the baby bullet. She has read my mind. We're working our way through purees of more veggies than Gerber makes. Texture is an issue for Emma, but we finally hit the right thickness for broccoli and she loves it, so MIL is making more. 10 AM - I dash off to get a pedicure for the first time in WAY too long - and MIL volunteered to watch Emma while I'm gone. 10:15 AM - So excited about the pedicure, I splash my foot into the water... and my jeans get a nice dip, too. Ooops. Oh well. I'm trying a new place and they have huge TVs tuned to Live with Kelly and I brought a book ("Something Borrowed"), so I'm fine with soggy jeans. Oh, and before I can start reading, I remembered that MH asked me to get tickets for a concert in June. I log into Ticketmaster on my phone and I'm not too late! 11:15 AM - Manicure with clear coat on my nails and I'm back on the road. Have to stop to pick up lunch - well, it's really a treat to myself, since this is going to be a rare day of Emma and I together all day. Normally, I have someone here during the day to watch her while I work - usually my mother in law or my Mom. Today, MIL has something she couldn't reschedule, so we're on our own for most of the day. 11:30 AM - Wash bottles for the pump and get Emma from the pack n play. 11:30 - 11:45 I read her Counting Kisses and she loves the kisses on her belly button the best. 11:50 AM - She starts to get squirmy and fussy. Maybe it is time for a nap. She has been boycotting naps lately, but then she sleeps 10+ hours at night, so I can't complain too much. 12-12:30 PM - I nurse her and she falls asleep. Easy transition to lay her down and I sneak away for a bit. 12:40 PM - Manage to log in to work for a bit, to see if I'm missing anything major with my impromptu late work day (or potential day off). It all depends on Emma's mood and whether she naps today. 2:30 PM - It's time for broccoli! 3 PM - We move on to play time (and lots of fussiness!) I ate my sandwich while she played. Sorry, I forgot to take a picture. 4:30 PM - Emma woke up and she's not a happy camper. Stupid teeth. 5:30 - 6:30 PM After soothing and nursing and diaper change, Emma played on her exersaucer, her activity mat and then just played with me. Nibbling on her side to get her to laugh is the best! 6:30 PM - Teething attack again complete with lovely drool and lots of screaming. Right on time, my husband comes home and he gives her cuddles and she calms down for a few minutes. 6:45 PM - She showed signs of being exhausted and ready for bed right around this time, so we went up to her room and started her bed time routine - pajamas, story, lights out, nursing, music. She stays in the room until morning. This was really early for her, but she was not a happy camper. Her teeth started to bother her really fast. 7:30 PM - Tried to lay her down in her crib and she woke up. This happened to be our first night of trying to transition her back into the crib from her rock n play. 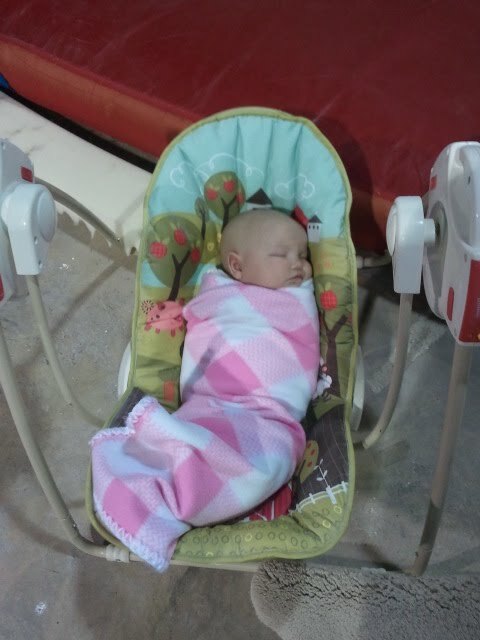 She sleeps so well in the rock 'n play, but her legs are getting too long. Must keep trying the crib! 8:30 PM - Waited a little bit longer before I tried to lay her down, she still woke up! 8:54 PM - Woke up again, kept crying due to her teeth, even after Tylenol, so I gave up and put her in the rock n play... and she slept nine hours. 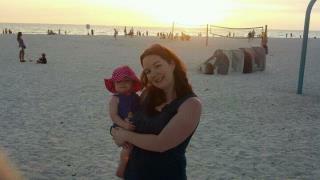 We had a blast on Anna Maria Island. 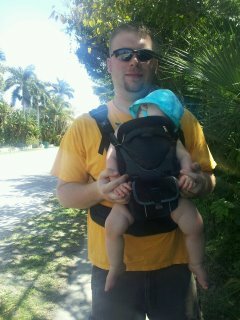 It was gorgeous, relaxing and soo much fun to experience with Isla! Here are some quick photos that highlight our trip.. more / info coming when life slows down a bit..
napping.. she napped awesome all trip! lots of outdoor time for the win! we took a morning walk almost every day after breakfast and she normally fell asleep for her morning nap that way and then i would read/relax by the pool til she woke up and then we'd climb back to the condo! on the beach for sunset.. she had just been swinging for like 20 minutes! she loved people watching. Blindsighted by Karin Slaughter was recommended to me by another friend who likes thrillers/ fast paced crime books and it did not disappoint. I flew through this by the pool, during nap times and during the national championship game cuz, I'm not a Kentucky or Kansas fan and my bracket no longer mattered to me. Speaking of, I should check the 4 I participated in. The book starts out with Sara meeting her younger sister for lunch and finding a woman near death on the toilet. She had some horrendous wounds and it obviously reminds Sara of something/someone. Soon after, a local college girl goes missing and is found on Sara's car in an interesting position. Then another person, key to the case goes missing. Will they figure out who is kidnapping and hurting the women of Grant County before there is another death? Better read to find out. The writing was fine for the type of book, it was fast paced, kind of graphic in places and thankfully the Sara/Jeffrey situation isn't too simple or too complicated and there are still new snippets being introduced so I can totally see this working as a series. Hey all, today we have Kelly, a Kindergarten Teacher, who has a fabulous blog, enjoys being active and traveling. She's pretty rad. If you would like to participate in a day in the life series email me at pinkflipflops44 at gmail dot com! Hi I'm Kelly from She Wears a Red Sox Cap. It was hard to pick a "typical" day, so I ended up leaving it to the last minute and Tuesday picked itself. It's a busy day, but relatively typical although it's the only day I tutor before work. On other days, I usually get to work by 7 to get work done. Luckily, I don't tutor until 4 on Mondays so that's when I get a lot done that I would normally do on Tuesday mornings. I think that's all you need to know- here goes a day in the life of me. 5:30am- I wake up thinking it's the middle of the night and head to the bathroom- I catch a glimpse of Eric's clock and realize it's 5:30. Noooooo! My alarm will go off at 5:45. Lie back in bed for a few minutes and finally just get up at 5:37. Shut off my alarm and jump in the shower. 6:00- Come downstairs and make myself breakfast. 6:10- Eat breakfast while I read blogs, check e-mail, do some research on restaurants in the theater district since we will be there on Friday night. 6:25- Say hi to Eric who is now downstairs about to eat breakfast, then head out of the house trying not to forget my lunch or anything else I need. Now I drive to tutoring, the whole way there no matter what radio station I switch to, they are discussion how cold it is out. Yes it is, is talking about it really helping? 6:40- I make it to tutoring where I am going to work with a 3rd grader. This is my second year working with him and he's a good kid. I've had to get pretty creative to keep him entertained lately, but it's usually worth it. Today we are going to do an activity with prefixes and suffixes, play a game called Stealing Bundles which I turned into a reading game, read the book "The Magic Finger" by Roald Dahl (well, a few pages of it...), write some spelling words and sentences and finish up with a game of reading Uno. 7:40- Leave tutoring and start to drive to work. I hate driving at the time when normal people drive- it's so much less relaxing than the early morning commute. 8:00- I make it into work. I always feel late on Tuesdays despite the fact that I'm still 45 minutes ahead of the kids. I immediately check my work e-mail. Triple score- no annoying e-mails from parents! 8:05- I post the schedule for the day and start planning my reading groups. I decide to move one of my groups up a level so I run upstairs to grab a new book for that group. 8:20- One of my work friends comes in and we discuss annoying e-mails from parents and how we hate them. 8:30- Write an e-mail to the school psychologist intern. I am helping her with something she has to do for grad school and I need to give her a heads up on what I'm going to "ask for help" with during our meeting tomorrow morning. She has to record herself helping me with a problem. God, I don't miss grad school. 8:43- Do an internet search for ways to improve reading fluency and end up on Pinterest- end up finding lots of good stuff and print it quickly before the kids arrive. 9:05- The kids gather on the rug for Morning Meeting. This is when we read the schedule and the morning message (I write it and then kids fill in some missing letters). After that we will have handwriting, writing workshop, snack and reading workshop. 11:10- It's recess time- my aide takes the kids out in the morning and I take them out in the afternoon. While they are outside, I do some cutting and set up for math and then I check my work e-mail. Ah, I knew I couldn't make it through the day without an irritating e-mail- this time from a mom who wants me to move her child's reading level up. Sigh. 11:30- The kids return and we start math. We are working on number combinations and the kids are writing addition problems to go with numbers 5 and 6. 12:20- It's time for lunch. My students eat in the classroom so I head to the teacher's room for a few minutes of quiet. I talk to the other teachers about annoying parent e-mails and annoying people in general. We do stop talking about school for a few minutes to discuss a sprint triathlon we are going to do together in May. 12:50 Back to the classroom and time for science. We have been studying sea creatures and writing about them during writing time. In science today, the kids do venn diagrams comparing the animals they are "studying." They do an awesome job and one of my kids who is repeating K and *really* struggled with writing last year declares that he wants to do all the writing for his group today- yay! 1:30- Time for recess again! This time I go out- I try to take some pictures of my kids at recess to show you guys but I suffer from paranoia that someone will recognize the playground so I end up not including them in this post- sorry, like I said I'm a little paranoid! 1:45- It's time for "choice time" which basically means time to play, for the kids. For me, it's time to start "assessing" (aka testing). Testing is huge in education right now and sadly kindergarten is not exempt from it, though I think the kids think they are. Today I am looking at math skills, particularly their ability to "change numbers" like if they are have 2 pennies and want to get 5, how many do they have to add? Yes, this is algebra on a kindergarten level. I also take a break from the math to read with my student who's mom e-mailed me earlier, I need to record an exact percentage of words correct vs. incorrect to report her reading level, yipee. 2:15- The kids head to PE and I go back to getting work done. I spend the entire half hour writing an e-mail back to the previously mentioned mom about her child's reading level. She is right that her daughter can technically read about 1 level above where I have her, but she is not able to answer the comprehension questions and she doesn't read fluently at all. Normally I wouldn't really care about this in kindergarten, but she is reading well enough that we need to start talking about how to not read like a robot :) The e-mail gets really long as I explain exactly what questions I need her to be able to answer, what fluency is in reading etc. 2:45- Pick up the kids from PE and get ready for dismissal. 3:00- The kids leave, one of the parents is late picking up so I chat with the student until his dad comes. 3:15- Grab all my stuff and jet out of school to be at my second tutoring kid of the day at 3:30. This student is in 2nd grade and I started working with him last June. He is pretty easy to entertain but if he's not entertained it's nearly impossible to get him to do anything. Sadly I have to do some homework with him and this is usually when it's a battle. Luckily today his homework is to write his spelling words twice. In order to get him to do this we do a race- I have to write the word five times and he has to write it twice- whoever does it first wins. Of course I lose and I don't even have to try- it takes me forever to write these days, I bet I could type faster than him though. Post-homework we play a reading bingo game with 2 syllable words, and read a book. At the end I chat with his mom about the results of his most recent testing at school. 4:30- Drive home and say hi to Eric who is working out in the basement. Then I go right upstairs and eat an early small dinner since I'm going to spinning at 6. I eat a small tuna sandwich made with just tuna and greek yogurt. While I eat I read some of The Hunger Games. I am loving this book but I really need more time to read it! 5:30- My friend comes to pick me up to the gym. We discuss how much we'd rather be drinking beer than going to spin. We also discuss how if our favorite instructor is not teaching we may turn around and go home. 5:50- Our favorite instructor is not teaching and we briefly contemplate going to a bar instead of class...but we don't. Sadly. 6:00- Class starts and I seriously regret my decision to go to spin instead of the bar- the instructor's microphone isn't working and she is YELLING. This is not helping my headache. 7:10- I get home and I remember it's one of my friends from work's 30th birthday tomorrow. I drag Eric to the liquor store down the street. We are the only people there on a Tuesday night. Awesome. I buy her a bottle of wine and myself one too, but I'm going to save it for a weekend, I swear. 8:00- I switch between reading Hunger Games, writing this post, reading blogs, checking facebook and generally wasting time until I start to get ready for bed at 9:20. I briefly consider doing a survey for work at 8:50 but I decide that will drive me to opening that bottle of wine I bought earlier! Good Monday Morning! 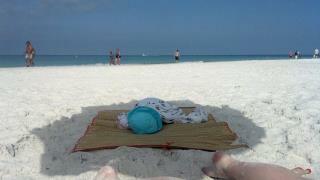 I am enjoying myself Gulf Side this week, so today we have a bonus day in the life! We have Nikki, who is here to share her rather busy day! Hello lovely readers. I'm Nikki @ Dancing in the Raine. I'm a single 28 year old workaholic. My career is "pension and annuity specialist" for a building trades union (I describe that here) and have 2 additional jobs, just for the fun of it. I'm so excited and thankful to be a part of this series! This is a typical Monday in my life. 6:45 am wake up and run to the bathroom & run back into the warm bed. 7:16 am Stare at my closet looking for something to wear. 7:30 am Still standing thinking..."I have NOTHING to wear!!!" 7:53 am Stop at the gas station and pick up a protein bar since I forgot to buy them this weekend. 8:25 am Open Pandora to Christmas music. Whaaat? I can't get rid of it for 3 mins! 9:00 am My mom is on her first break so I spend the next 15 mins texting her and checking my March Madness bracket which is looking pretty sad now. 9:30 am Guess I should start working now. 10:45 am Recap The Hunger Games again but this time with my wbff (work bff) whose kids went to see it. 12:00 pm Sort out my basket while I wait for B to come back from lunch so I can go. 1:00 pm return to work and ready to bite into my Tacos. They're beef! YUCK! It's such a disappointment. I check Facebook, Twitter and Pinterest all while I'm eating my tacos. 1:45 pm Open the mail. This is sometimes the funnest part of my job. It's always good for a laugh at the things that get mailed to us. 3:00 pm Whoa where did this headache come from? 3:30 pm Now my stomach hurts like crazy. Did I get food poisoning from those disgusting beef tacos? 4:22 pm I have 8 minutes left of work to kill maybe surf the internet? 5:45 pm Chat with my co-workers. One about his upcoming wedding in Panama Beach, another about his trip to Chicago tomorrow where he rubs it in that he's going to the Apple Store. And another discusses his new fad diet of only eating 500 calories a day! 6:35 pm It's quiet in the show room now so I pull out my book. I've read this before but felt inspired to read it again. 8:15 pm Get home and love on my kitty cat and decide to make a little bit of pasta and chicken. I really try not to eat so late on Monday's but need a little something in my belly. 8:45 Eat and finish an episode of Kourtney & Kim take New York. I am so behind on the Kardiashian episodes and I completely understand why Kim left Kris! UGH he gets on my nerves! 9:25 Climb in bed! Ahhh this feels good! I check Twitter, Facebook, Instagram and catch up on Word With Friends, Scramble With Friends & Draw Something. Then I continue on my book. 10:15 Lights out. Check Twitter one more time...Good Night World! Thanks, Nikki!! Sounds like a full day! Do you pick out your clothes the ahead of time or is it a mad scramble?